Book early – Now taking bookings through to December 2019. You can email or telephone for prices or a quote. Birthday Parties start from £185.00 for 2hrs in the North Leeds area. Discount on private party packages Mon – Thursday with discounted travel or free bubble machine. Special school disco rates available. 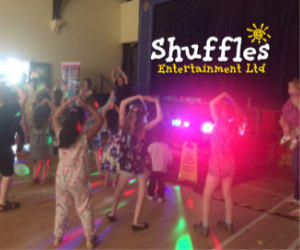 DISCO, DANCE & SPORTS parties. We cater for small to large events and can cater for children with additional needs. Party packages are suitable for 3-11years. BELL TENT PARTY HIRE – Hire a beautiful 5m canvas bell tent for sleep over parties and tea parties. Decorated and set up ready to go. Full details on our website. SOFT PLAY PACKAGE’s for under 5’s We have a huge range of soft play for preschool age children including a brand new small tots castle for smaller venues. NEW INFLATABLES for hire or book with an entertainment package and get 20% off the hire price. We have character castles, slides, obstacle course, combo units, princess and pirate castles, Woodland, jungle and sea themed units with lots of add on options.